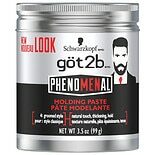 Shop Got2b Phenomenal Molding Paste (3.5 oz. )3.5 oz. Molding paste is a hairstyling product that tends to hold their hairstyle firmer than hair sprays or gels. You can use it to create different types of looks. Molding paste can be used to add shine to your hair or to get a matte finish. It can be applied to get a dry look or a slicked-back look. It can provide a firm but flexible hold or a strong, rigid hold. Molding paste for men is designed to keep the hairstyle of males well-maintained for hours. The molding paste contains styling agents, wax, wheat and amino acids that prevent moisture loss and flaking. 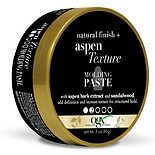 Molding paste for women provides supreme hold and makes your hair feel smooth after use. Molding paste for women is specially formulated to protect against moisture loss and provide complete control. Even hair gel has different formulas for men and women with different scents and hold strength differentiating them. Molding silk is commonly used as a sculpting and molding paste. Molding silk is a silk fiber based paste. It is perfect for creating hairstyles that need sculpted shape and definition. It provides extra volume to your hair. Just use your hands to apply it to wet or dry hair and set your desired style.